I just got my result on the Arsenic re-test that I took in last Wednesday--We are so pleased---Arsenic level is now 0.0010 down from 0.0185 mg/L. I wanted to take a minute and fill you in on the results we got from installing our ArsenicMaster water treatment system. We live in New Hampshire and we have a lot of granite around us. Consequently we have high metal content in our water. Metals such as manganese, arsenic, and uranium. Here are some of the numbers before the install. Manganese - .055 mg/L or parts per billion. Arsenic - .1476 mg/L or parts per billion. Iron - .073 mg/L or parts per billion. We shopped around a lot and we didn't want to lose our water volume. Reverse osmosis wouldn't treat the whole house. Other systems would cut our water flow in half. We took a big risk in trusting this company. Now we are very pleased at our results. It was worth it. I would recommend this product to anyone that has the metal content the we had. The technical support has been fabulous with John. John has been helpful all the way through this process. We are pleased with our ArsenicMaster system. It was definitely worth the money. "Our water system is up and has passed all required testing. Before installation of the Arsenic Master our new well tested at 18ppb arsenic, not a bunch but above the mandated maximum. Following installation our well tested below the minimum threshold of the state lab test, many thanks for an excellent product and particularly to John for his technical support. When I think of your company I think of Benchmark Customer Service! Well done." "Nick / John.......I had my water retested after the installation of these filters and everything came back a big fat "0". Your filters did everything you said they would.....Thank you. You will be getting my business again!! Thanks Again"
See our new, even more effective Arsenic Treatment System. "Check out my review at: https://www.youtube.com/watch?v=B3FDlfjXYuk"
"Howdy, I installed the fluoride filter you custom built for me. I'm a water treatment operator at Ft. Richards in Alaska. I did a fluoride sample last night, raw well water was .99mg/l. 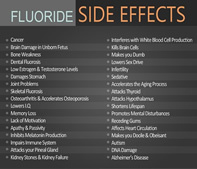 Product water after fluoride filter was zero. Thanks for a fine product!!!" "We recently (November 2007) bought the PureMaster and FluorideMaster Whole House Water Filters, and we are very pleased with them. It is so nice not having to bother with the [other point-of-use] faucet and shower filters we were using before...Thanks for your great products and sharing your expertise!" Click here to view the FluorideMaster™ Premium Whole House Fluoride Water Filtration System. "I bought the MetalMaster for my VERY BAD iron water. My plumber was very skeptical about this filtration system. He hooked it up and he couldn't believe what he saw! Before the MetalMaster, my water was dingy brown, red, and smelled horrible. The plumber installed this system and my water now is clear, has no bad smell and actually tastes good! My plumber was awed by this, he said he would be able to sell hundreds of these! There are no more rust stains in the sinks, commodes, or showers. Without this system, I would not have purchased this house because I would not have even wanted to shower in the water that I had before and I didn't want to add chemcals to my water, like the salt, so this is the perfect system. I cannot say what a difference it has made in my water. Nor can I say enough good things about the MetalMaster, I am so glad I found you!" We have installed our MetalMaster Filtration system, and it is wonderful. We can drink the water out of the tap. It has made such a difference and it has only been in 4 days. There are two guys that work with Bill at the State and they are very interested in them. We have told just about everyone that we have seen about them. I have given them your web site address. I still can not find the site for the MetalMaster. Can you e-mail that to me? I will then print it out and use as a reference. I thank you for steering us to this system. We really appreciate it. You may use this as a testimonial if you would like. Best Regards and peace to you and yours this holiday season." "A year ago I bought property and had a well dug. The water was not good quality. It was brown/orange, tasted bad and caused rust stains in all the sinks, shower and it even ruined some of my clothes. It took your MetalMaster system along with two different additional cartridge filters to get the water I wanted, but so far it's been worth every penny! I've only had it in place for a week, but I can't believe the change in my water quality. Thanks to you and especially your Tech. Support Team for providing such helpful information on what I needed. You guys rock!" "What a truly refreshing change. A product that actually lives up to its claims (and then some!) When I contacted you, I was guided through the process of determining the best filter for the problems. Not only was the price extremely fair, but the delivery and self-installation were flawless. But, would it do the job? In just a few short words, 'even better than advertised'. In under a week after installation, the water in my home was so clear and iron free that I was amazed. No past systems, (costing far more) had ever performed like this. And, as an added bonus, it is virtually maintenance free. No tons of salt and constant adjustments. Thanks for the great product." Got the metal master hooked up and I love the iron filter I purchased in November, I cannot believe what a difference it made in just a few short hours, the difference is incredible. now it looks like I will be moving into town, there is a lot of chlorine in town water, I would like to eliminate as much as possible looks like I need the pure 750,or can you suggest a smaller system, besides the p.o.e systems? "I piped in my Metal Master on Sunday. Wow! No more sulfur smell what a difference, my water is completely clear, and just feels and looks better. My son was the ultimate test, he would not take showers at my house due to the sulfur smell. He took a shower this morning and said the water was just great. I'm very pleased and grateful for Metal Master." I got the two new nuts and installed them as you instructed. The system is all hooked up and functioning. I've already noticed a difference in the iron content, as in NO IRON!!!! Thanks again." "We installed the Metal Master in our moutain home in Arizona 3 weeks ago. For 30 years we have not been able to drink the well water due to stong odor and rust. Immediately after the installation I had a glass of water from the kitchen sink. No more odor, no more rust stains. Thank you." "Excellent Product / No More Rotten Egg Odor In My Water / Great Communication A+ Buyer:"
I now have the system up and running and I am truly amazed no more rotten egg odor in my water. You have an awesome product. I am going to give your information to my neighbor who is a plumber and recently had a problem with a customers water and the manufacturer of the system he installed went out of business so he had to reimburse the customer apparently it was a iron problem and the used some aerator type system and it caused a lot of air in the pipes. Thanks so much"
"The Vitasalus PureMaster V-750 Whole House Water Filter System is like Magic! The PureMaster V-750 really works just like in the description!!! A+"
"I recently installed the V-750 and am very pleased with the change in water taste, no more chlorine taste smell etc THANK YOU!" "We purchased a V-750 filtration system earlier this year. We are extremely pleased, with it's performance. Our skin looks great after bathing, we don't have to pinch our noses while drinking a glass of water, and our food is much more tasty. A million thank you's,"
"I am about to purchase my third house system. Just moving and can't live without clean water. This system is easy to take care of and simple to enjoy, tasting clean pure water. Worth every penny! Nice to be able to shower and drink clean water from every spout in the house. We needed customer service with the last one and the tech team was so helpful. They found a special part for us that met our needs. Love this company, giving ten stars if I could. " "Just wanted to let you know that I finally got my Vitasalus PureMaster V-700 / FluorideMaster Combo and Hardness Master installed. All is well and my water quality is much happier. FYI, the plumber commented on the quality of the system. I plan on giving them feedback after a fair months' evaluation. At which time they may be interested in promoting your product." "Popular at the Fresh Levant Bistro. Thank you for a wonderful product. We have it installed at our bistro restaurant, which is all about clean, healthy food (everything we offer is gluten-free, natural, non-GMO, and usually organic too), since we also needed clean, fluoride-free water. Our health-conscious customers often tell us that our water just tastes better, as do our coffees and teas, and I sometimes explain to them that it is because our water is highly filtered to be fluoride-free and that this filtration process also helps balance the water's pH for a smoother, more balanced taste." "Amazing - should have done this years ago!" "We are on our second set of PureMaster/FluorideMaster Combo System. Love them & have "turned on" several friends to them. Have been using for 7 years"
"We are extremely happy with the PureMaster V-700 and FluorideMaster Premium Whole House Water Filtration Systems, and the prompt, helpful customer service we've received. Water pressure was a concern of ours, and we noticed no drop in pressure after the system was installed. We are enjoying the freedom of being able to drink water from any tap in the house, instead of from a water filter installed at the kitchen sink. The water is clear and delicious without the chlorine smell it had in the past. And somehow the bath water now has a lovely shade of blue. Our plumber installed shut-off valves on either side of the filter system - highly recommended for ease of use." I've been trying to locate Equinox Internatonal for 10 years. I became acquainted with Equinox products in 1996 and I couldn't settle for just any Equinox. It had to be THIS Equinox. I don't know where you went, but I am relieved to see that you're back. Your EQ-10 Countertop Water Filtration System is the best in the market. I haven't had one that compared to it. Take care and God bless." "Just wanted to say thanks! I've used the EQ-40 Shower Water Filter System for 1 week, and am very pleased. Our city had bad water and now we have a plant that made it safe or so they say but the chlorine is is high and it's really harmful on skin, hair and breathing it. I noticed a difference the first time I used it, I have long hair and it was really hard to comb it even though I use conditioner. I use less conditioner now and no lotion on my skin since I started using the filter. My hair was brittle and in one week is not any more, the broken hair that was on my bath rug is no longer there, no dry skin at all. I even fill a container and use it in my coffee pot, I was using a filter in my frig. Kenmore pure water and my coffee would have a film after sitting but if I use water from your filter it's clear. It's hands down the best money I've spent on anything in a long time, it's made a big difference. Amazing! Thanks so much! I've already recommended it to friends and family."